Putting together a stand up desk or a walking workstation can be a surprisingly daunting affair. Not only is there a dizzying array of options to compare and consider, but on top of that a lot of the components needed to assemble an ergonomically proper standing or treadmill desk run in the hundreds, if not thousands of dollars. With so few places to try these adjustable-height desks, office treadmills, monitor arms, standing mats, and more in person, how is one supposed to find the best equipment for their situation? The best place to find in-depth information about the best and most popular products available is our full reviews. But if you want a quicker overview of your options when putting together your stand up desk or walking workstation, this is where you want to be. 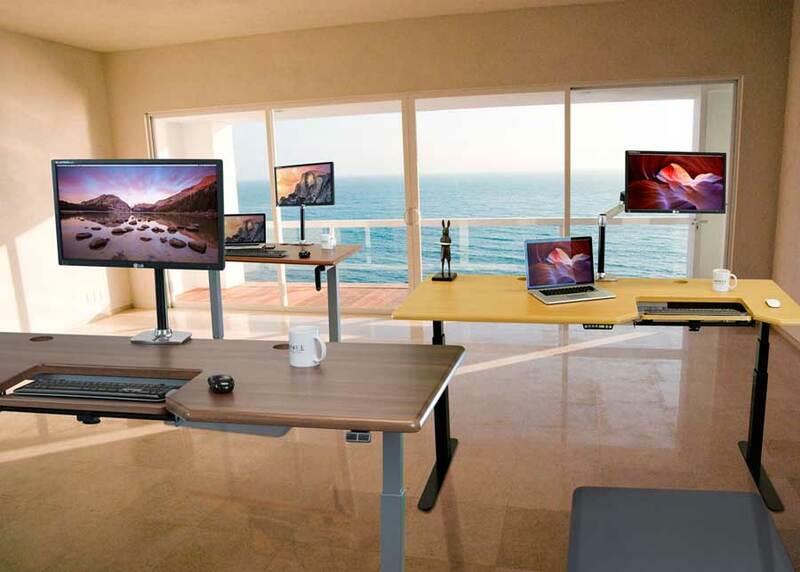 We’ve put together several comparison reviews of the products most necessary to building a workstation that will let you cycle through sitting, standing, and ideally walking throughout your work day. We continually update these comparison reviews as we examine more products. Whether you’re looking through office treadmills, standing mats, or adjustable-height desks, these comparison reviews will give you an abridged version of each product’s pros and cons as well as provide a table of features so you can compare different products side-by-side. While all corner desks and L-desks will fit into a corner there are significant differences between the two. To keep it all cleanly delineated we've opted to categorize all corner desks that are built with a single desktops as "true" corner desks and all those built with two desktops as "true" L-shaped standing desks. Varidesk has also stimulated the emergence of some sixty competitors' units, and counting. All of them attacking the market with better mouse traps—be it higher quality, better ergonomics, greater features, or just lower price than the Varidesk models. Standing meetings are the future, offering significant benefits to employees' health and leading to generally shorter meetings as well. Adjustable-height conference tables empower an organization to conduct standing meetings without losing the ability to hold traditional seated conferences. Additionally, they offer unprecedented functionality for the home. Here, you'll find a comparison of sit-stand tables so you can decide which is right for you. When standing desks first came into popularity, the kinds of materials used for desktops and the selection of shapes, sizes and colors were very limited. Fast forward to today and an online shopper can now find an absolutely overwhelming array of choices, from ultra-cheap to ultra-premium, depending on how much your pocket book can handle. Don’t worry, we’re here to help you sort through all the options.